There will always be questions. And Viur will help you find the answers. Whether you are the CEO, manager or developer, there are always questions that need answering. Viur enables you to answer these questions quickly and easily through visualization and data exploration. Leverage analytics to promote information sharing and transparency on the fly. Effortless analytics and data visualization. Alerts allow you to be notified by E-mail when a metric meets a certain criteria, it is useful when you want to be advised when a chart reaches a certain goal or objective. 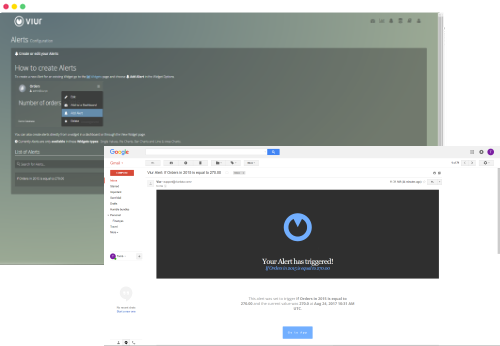 Receive a report snapshot of your favorite dashboards directly on your email inbox as an image. You can easily choose the frequency, the time and which team members should receive the report. 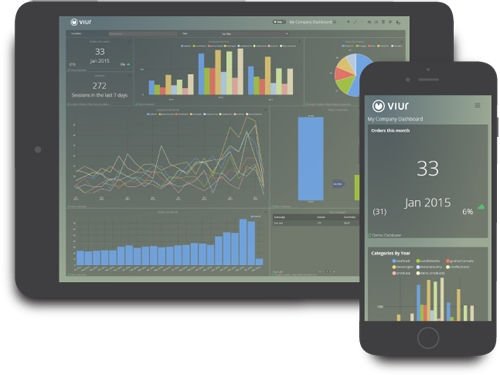 Viur Dashboards are fully responsive and can adapt to any screen size so you can track your business metrics from anywhere, and from any device. 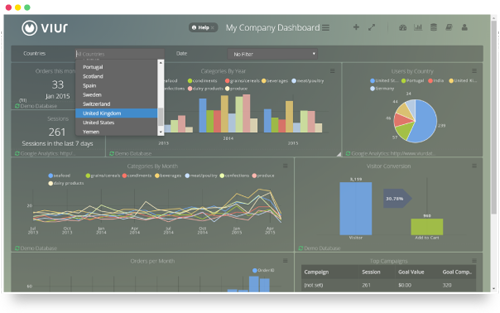 With global dashboard filters, dashboards become more interactive by making it easy to filter multiple charts at the same time. You can directly filter widgets from the dashboard by single and multiple values or a date period. 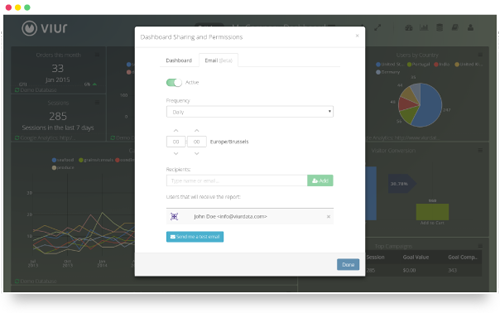 You can share your dashboards with your team, clients or the whole world. You can export data in CSV format to create new workflows. You can start by creating your charts using drag’n’drop, but if greater control is needed you can jump right into our powerful query editor to check the generated SQL and make your changes. A powerful and intelligent autocomplete will guide you every step of the way. 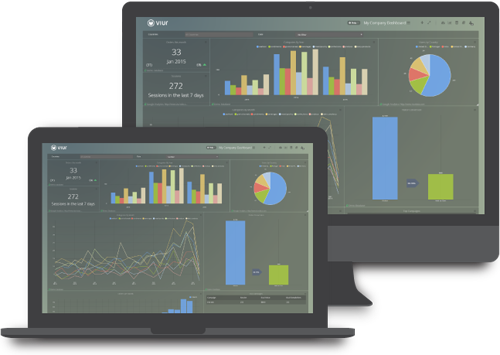 By using the drag’n’drop or SQL mode through our intelligent system you can create charts and metrics that turn into valuable insights in less time then on typical solutions. 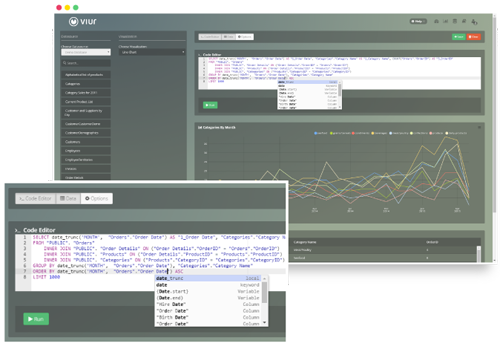 Viur can show you your data in all of the most common types of charts. Connect to all your data sources and integrate them with ease. Explore & Analyze data at the speed of thought. Our intelligent system will guide you along the way. Your data stays with you. We connect directly to the data sources and all the connections are encrypted using the most safe standards. 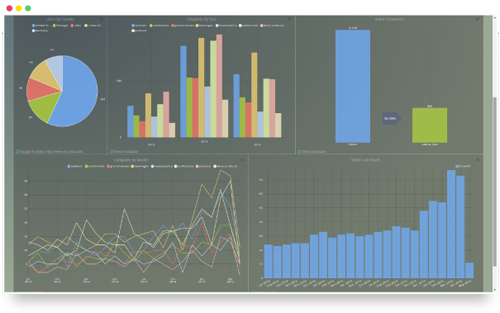 Create charts and metrics directly from SQL using our powerful editor. Perform complex analysis with the easiness of drag ‘n’ drop. Access to a pool of ready to use metrics and charts for Google Analytics and other services to give you instant value and insights. Receive report snapshots of your dashboards directly in your email inbox. Track your business from anywhere and on any device.